Our Microsoft Visio training courses will show you how to make the most of this software, to design, document and maintain your processes and systems. Led by highly experienced Visio trainers with many years of industry experience, they are very hands-on and practical. We make sure that you practise the techniques we teach you. That way you leave the course confident and ready to put them to use. We also provide private training for groups and individuals. This can be at your offices or one of our training centres. Private training allows us to customise the course topics to your exact requirements, and run it on a date that suits you. This Microsoft Visio training course will teach you how to use Visio to transform your ideas and information into understanding and action. Take your Visio skills to the next level. Our courses are carefully designed to make you a faster and more efficient Visio user. We believe that real skills are developed through practical application not just through classroom learning. This means that you should expect to spend plenty of time working in Visio and putting what you have been taught into practice. Our exercises are carefully chosen to emphasise the key aspects of each lesson, and of course, our tutors are there to help if you’ve any questions. 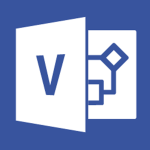 MS Visio is a diagram and flowchart tool. It allows you to create precise, clear diagrams very quickly and simply. It comes with a large number (several hundred) of built-in in shapes and objects, however, it is flexible enough that you can import your own shapes or create new ones within Visio. It works in both 2D to create more traditional flowcharts and also 3D where it can be used to create simple maps and the like. Advanced users can use it to display live data live from other sources. Drawing that data from a live Access database or Excel spreadsheet for example. Microsoft purchased Visio in 2000 to add it to their Office suite. Prior to that it was a stand alone product offered by the Shapeware Corporation. Since then it has been part of the Microsoft Office family of programs and released on the standard Office update cycle, so there are 2003, 2007, 2010, 2013 and 2016 versions. If it also part of Office 365 today. It is not part of the Office for Mac suite however. 1. Training with a highly experienced Microsoft Visio certified instructor. 2. A full-colour A4 Visio course manual for you to take home.